Wrapping Up a Successful Spring at BroadFutures! BroadFutures Interns and Mentors enjoying the Game on 4/13. We are excited to be wrapping up another successful spring at BroadFutures! With only a few days left in our Winter Program, we cannot believe how the time has flown and are so proud of the incredible growth our interns have shown. It has been an amazing program, and we are so thankful to our wonderful interns, parents, employer partners, and staff for helping us all to achieve success. 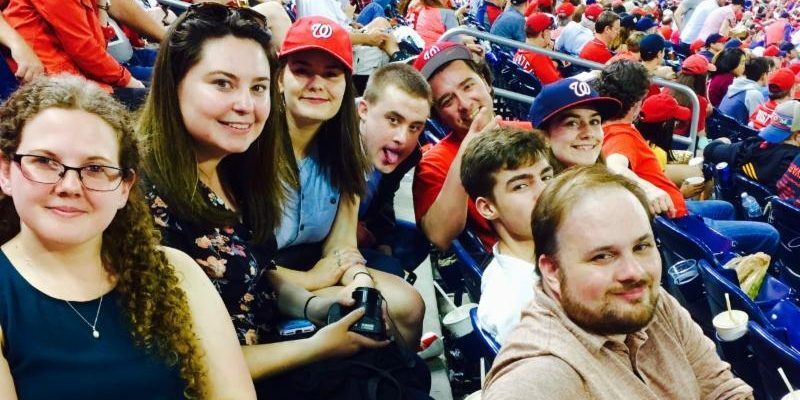 As a reward for all of our hard work, our interns and staff enjoyed a trip to Nationals Park on April 13th. We would like to give a HUGE thanks to Nationals Park for sponsoring our tickets and hosting us for a fun evening. BroadFutures' Movie Screening and Q&A! led an open Q&A following the film with our interns and members of the audience. We extend a HUGE thank you to Krys, for having the insight and creativity to bring these stories to light, and to LeDerick, for his courage and tenacity in telling his story so that others may be inspired by his example. Alec Callahan is a 21-year-old young man from Rockville, MD who was a member of BroadFutures' first cohort!!! During his time at BroadFutures, he interned at The AES Corporation, an international energy company. He was responsible for a variety of administrative projects within the Human Resources Department. It was an exceedingly positive experience for both Alec and AES. AES was thrilled to have Alec on their team, and praised his determination, motivation, and unparalleled ability to focus. "BroadFutures made me come out of my shell and helped me to be inspired to work and have fun and show my skills at the workforce." The Think Lead Innovate Foundation (TLI) is a public charity that partners with entities from industry, academia, government, and the nonprofit sector to explore new approaches to existing problems. TLI's mission is to promote new and innovative thinking that leads to transformative change in the healthcare, education, economic opportunity, and environmental arenas. TLI became an employer partner this winter, but Inergix, the former company of TLI's Founder and Chairman Bill Oldham, was one of our first employer partners for our pilot program in 2014. "The entire BroadFutures team has been very engaged and supportive through the process of selecting and mentoring both us and our team. We truly enjoy being able to provide real-life work experience to young people as they determine the path they wish to take as a career, and hopefully a positive experience they can draw upon going forward. It has been a rewarding experience for us to be able to teach a young person about what we do as an organization, why we do it, and how each project we execute supports the mission of the organization. It has also been valuable for us to remind ourselves of this since it is very easy to get caught up in the day to day tasks. Our intern Ryan has provided us with a fresh perspective and insights as we developed content for a new "health coach" mobile app. Since the app is designed for the younger generation, his perspective as to what is relevant and helpful content was very much needed and welcomed." Thank you to Shawn Murphy and the incredible team at the TLI Foundation. We look forward to our ongoing successful partnership!!! Know someone who would be interested in what BroadFutures does? Know someone who might be interested in applying? to stay up to date on what we are doing here at BroadFutures. We are excited to be wrapping up another successful spring at BroadFutures! With only a few days left in our Winter Program, we cannot believe how the time has flown and are so proud of the incredible growth our interns have shown. It has been an amazing program, and we are so thankful to our wonderful interns, parents, employer partners, and staff for helping us all to achieve success. We are looking forward to our upcoming Summer Program, as we expand our program, develop new partnerships, and welcome new incredible interns . BroadFutures’ Movie Screening and Q&A! On March 30th, we hosted a screening of the documentary Normal Isn’t Real: Succeeding with Learning Disabilities and ADHD, which highlights the professional journeys of 4 individuals with LD/ADHD, including both their struggles with learning differently and their ultimate successes. We were thrilled to be joined by nationally known Producer and Filmmaker Krys Kornmeier, as well as one of the film’s featured professionals, LeDerick Horne, a disability advocate, poet, and entrepreneur. Krys and LeDerick led an open Q&A following the film with our interns and members of the audience. Alec Callahan is a 21-year-old young man from Rockville, MD who was a member of BroadFutures’ first cohort!!! During his time at BroadFutures, he interned at The AES Corporation, an international energy company. He was responsible for a variety of administrative projects within the Human Resources Department. It was an exceedingly positive experience for both Alec and AES. AES was thrilled to have Alec on their team, and praised his determination, motivation, and unparalleled ability to focus. The Think Lead Innovate Foundation (TLI) is a public charity that partners with entities from industry, academia, government, and the nonprofit sector to explore new approaches to existing problems. TLI’s mission is to promote new and innovative thinking that leads to transformative change in the healthcare, education, economic opportunity, and environmental arenas. Like us on Facebook, Follow us on Twitter, Connect with us on LinkedIN, and Follow us on Instagram to stay up to date on what we are doing here at BroadFutures.